The Northern Territory Government has released a concept design for improvements to the Stuart Highway to enhance safety and access to Pinelands and Holtze. The Pinelands and Holtze precincts are busy industrial areas southeast of Darwin, where businesses are serviced daily by heavy vehicles and road trains. In 2016, the Department of Infrastructure, Planning and Logistics commenced planning to improve road safety and heavy vehicle access in these areas, to and from Stuart Highway. Following public consultation undertaken in 2016 and 2017, a concept design has been prepared by local traffic engineering consultant, Tonkin Consulting. The design solution will accommodate future growth in the area maintain an appropriate level of service for local traffic increases and provide safe pedestrian crossing locations between the precincts. provision for turning lanes off the Stuart Highway into Pinelands industrial area which is frequented by road trains and heavy vehicles. To provide feedback to the Project Team on the concept design, please contact True North Strategic Communication on feedback@truenorthcomm.com.au or 8981 6445. Community consultation on this project has been extended until 2 November 2018. The project will then move to detailed design. Download the proposed design factsheet (3.7 mb). Q) Why is Government wanting to deliver these road changes? 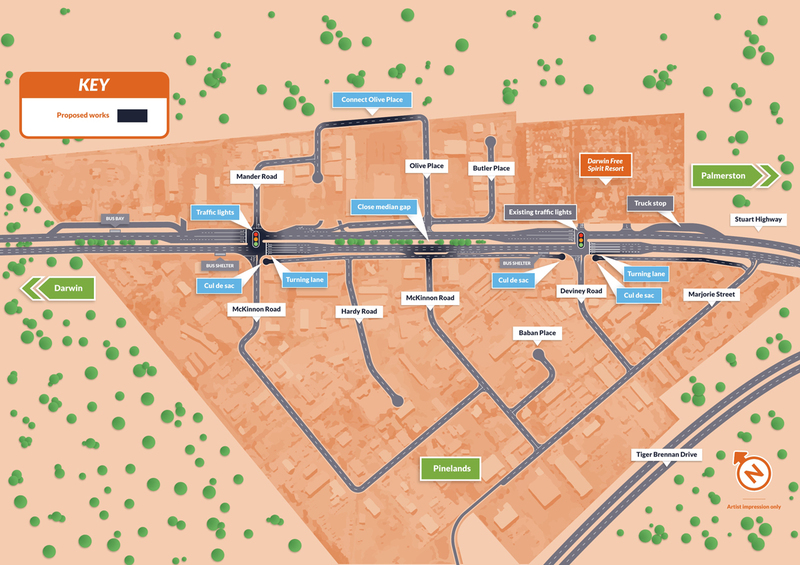 The Pinelands and Holtze industrial precincts, located along the Stuart Highway, generate heavy vehicle and road train movements, and prior to the opening of the Gateway Shopping Centre in Yarrawonga, heavy vehicles travelling from the south to Pinelands were able to use the left turn into Marjorie Street off the Stuart Highway (refer map below). This access was possible due to a detour via Yarrawonga Road that allowed traffic to turn safely through Yarrawonga Road / Roystonea Avenue intersection into the outermost lane of Roystonea Avenue (before becoming Stuart Highway). The project is in its consultation phase. Stage 1 consultation was to gather feedback from key stakeholders, including local businesses within the Pinelands and Holtze precincts on the current heavy vehicle access routes used, traffic issues and ideas for improvement. Stage 2 consultation is underway and feedback on the proposed concept design is encouraged. Consultation has been extended following the Pineland Community meeting to 2 November. Some of the feedback to date has highlighted concerns with cul-de-sacs on service roads and a desire for access to Tiger Brennan Drive. Q) Can the design be changed? Yes. The consultation closing date has been extended to accommodate the feedback that was received at the Pinelands community meeting. Feedback is encouraged prior to 2 November 2018 and will be included in the next design iteration based on its merits. Q) What are the current safety issues? With the increase in commuter and business traffic between Darwin and Palmerston, and the number of uncontrolled access in and out of Pinelands and Holtze Industrial Precinct; the conflict between through and turning traffic in and out of these precincts has increased. Over the seven years to October 2018 there have been 51 crashes involving casualties including 1 fatal accident and 22 where people requiring admission to hospital for vehicle injuries. The major cause of crashes involving casualties is rear end with angle crashes next highest. Q) Why haven’t we been consulted previously? Stage 1 consultation occurred in 2016-17 where 34 resident businesses were consulted. Stage 2 consultation commenced on 14 September 2018 and closed on 2 November 2018. Consultation was open for seven weeks to ensure all businesses and property owners had the opportunity to contribute. To-date 64 resident businesses have been contacted through door knocking, verbal briefings, letter box drops and a number of group meetings. Q) What have been the main issues raised during Stage 2 consultation to date. The sole purpose of the project is to facilitate the Youth Justice Precinct. Resident businesses and property owners are generally supportive of the proposal to join Olive Place and Mander Roads, though with some concerns raised in respect to closing the median at Olive Place. Q) What will the Government do in relation to the issues raised by the community? All feedback will be assessed on merit and worked through with the Department’s design consultants. The community will also have an opportunity to comment on the next design iteration which will be released in early 2019. Q) Is the Youth Justice Centre the real motivation for traffic lights at McKinnon Road (North)? maintain an acceptable level of service for future arterial traffic increases. The Royal Commission into the Protection and Detention of Children in the Northern Territory recommendations were announced in November 2017 and the preferred site for Centre was announced in September 2018.